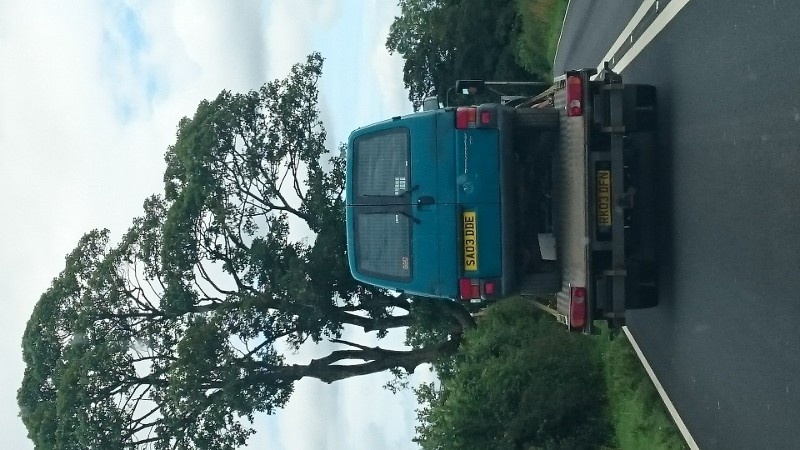 I remember a day when I used to cram 4 bikes and 4 people into and onto a Subaru Justy, and for those that don’t know what a Justy is, it’s a mini sized 4 wheel drive car… So you can imagine how tight that was. Needless to say, I used to look at those with vans with a great deal of envy. The envy probably started because I had tyre tread pressed against my head whilst trying to check my mirrors or the fact that I was closer to 3 lads than I’ve ever really wanted to be. It was always the dream “once I make it, I’m going to buy a van”. 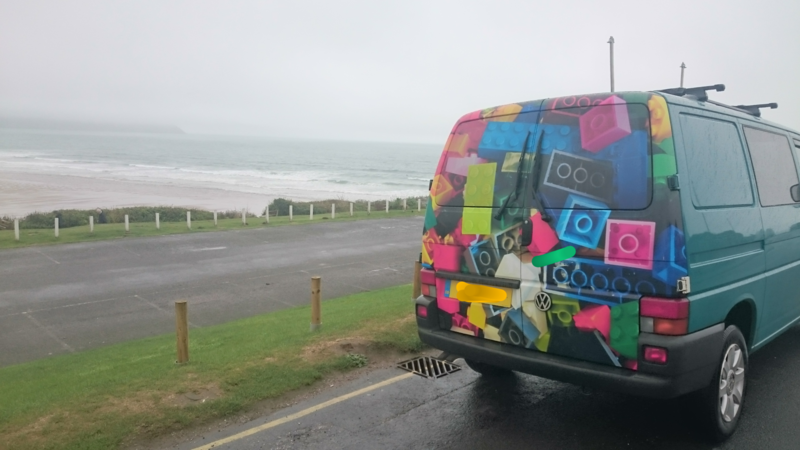 It was going to be stickered up to the max and be the ultimate adventure-mobile. 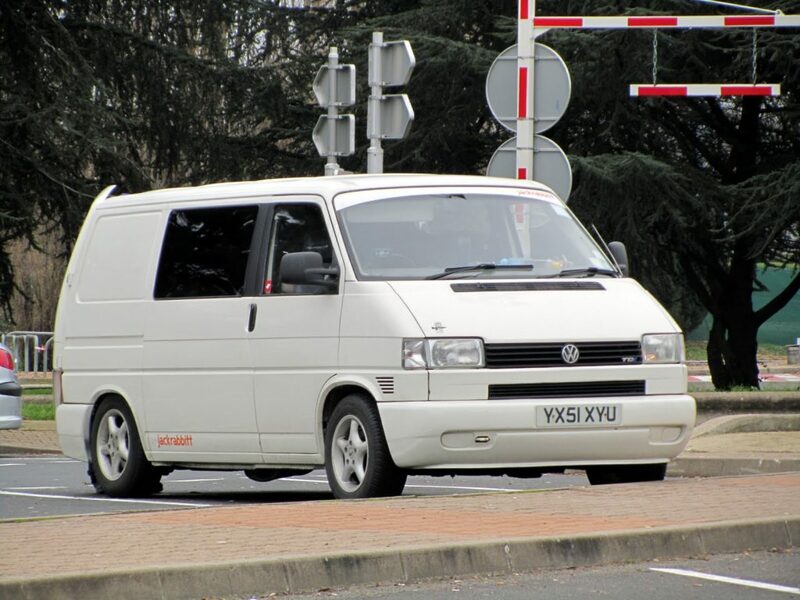 Then I met my wife, then images of family cars (I was looking at the VW Sharan) started to interfere with the dream, she wasn’t keen on the idea of driving a big ol’ van round. 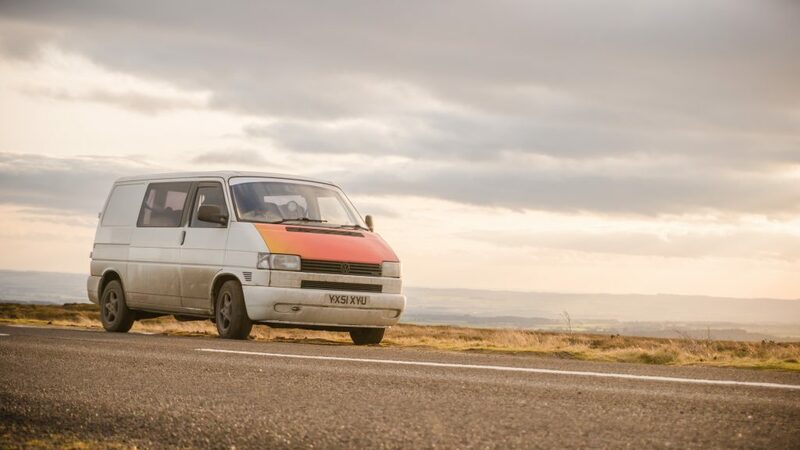 So a few years in all dreams had pretty much faded… BUT THEN… while we were looking for a bigger car than her little Ibiza, we discovered a Mazda Bongo… we took a look in as a bit of a joke, and then she instantly fell in love with the idea of having a camper van… with beds and seats and social space. 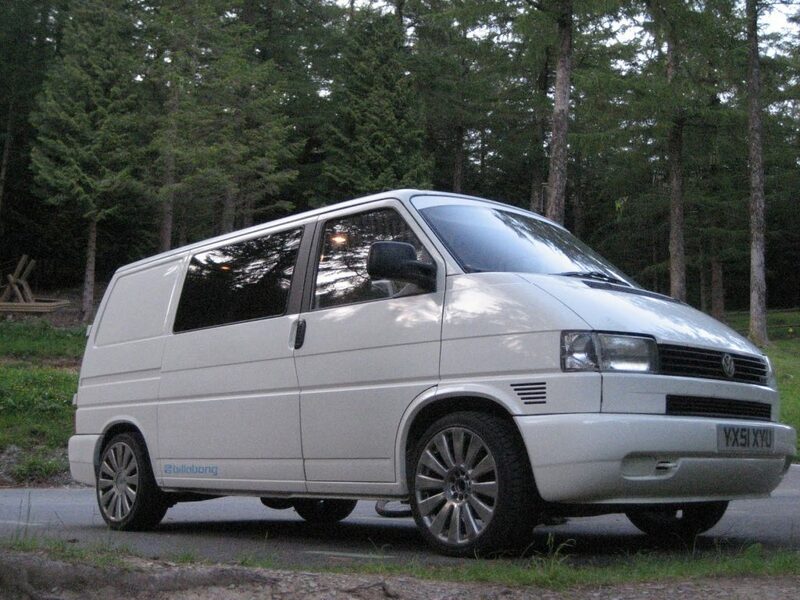 Fortunately we were with my friend Proudy who said… “Don’t get that, get a VWT4″… me: “OK, I’m listening…”. Then Proudy set off on his sales pitch, I’ve always known that VW have a bit of a cult following but that was the extent of my knowledge of even my interest. 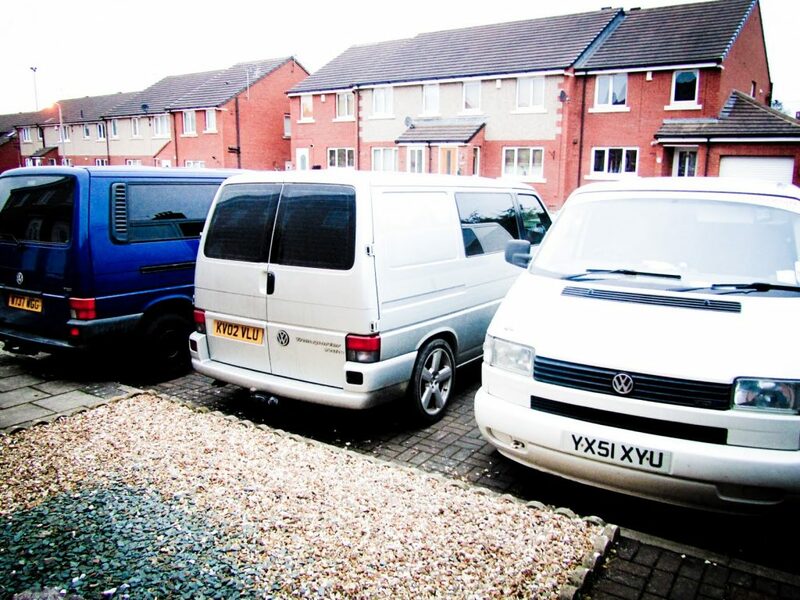 “They’re one of the most reliable vans on the road if you get a 2.5tdi, they pull strong and fast, comfy to drive, and easily modded to do whatever you want with them, you have a complete blank canvas in the back to build what you want, a bed, seats, table and chairs, ball pool… anything you want” … We then started on the path of looking for a VW Transporter, only to find that they really hold their value, old knackered vans were selling for £2k upwards… so it was back to the dreaming for a while. While were looking for a house after coming home from our snow season in Morzine, we were living with a friend called Rich, and then he stumbled on a fantastic deal of a T4 so snapped it up, and arrived on his doorstep with a lovely looking silver van… we got in to have a look… now we had to get one… we were in love, well and truly! 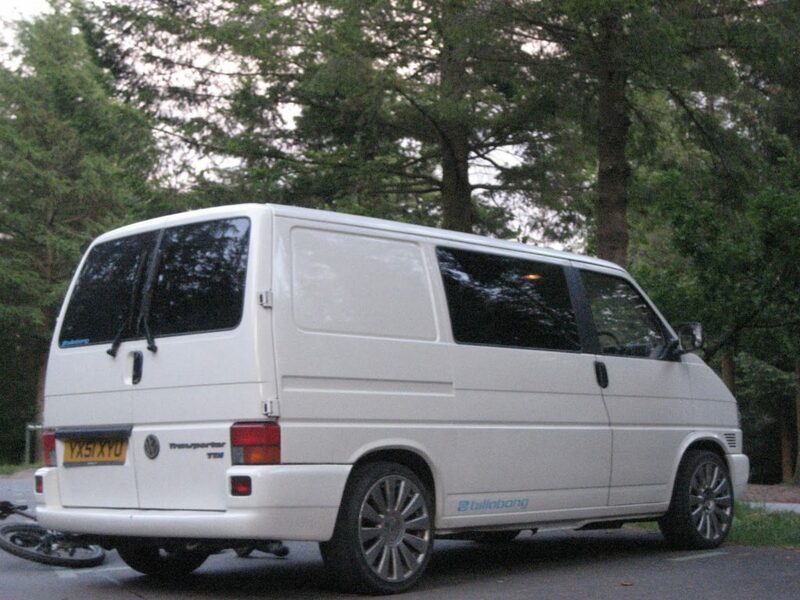 So we took to ebay, had everyone hunting for a van for us, and then my mother in law found a day van that had most of the work done to it, lowered, 18″ alloys, windows put in the back, etc etc. We loved it, but kept searching just in case. We kept finding it and it kept following us, so we looked into it some more. Turned out the guy selling it was the guy that gave me my first few surf lessons. We got in touch, went to see it, and now, we own it. 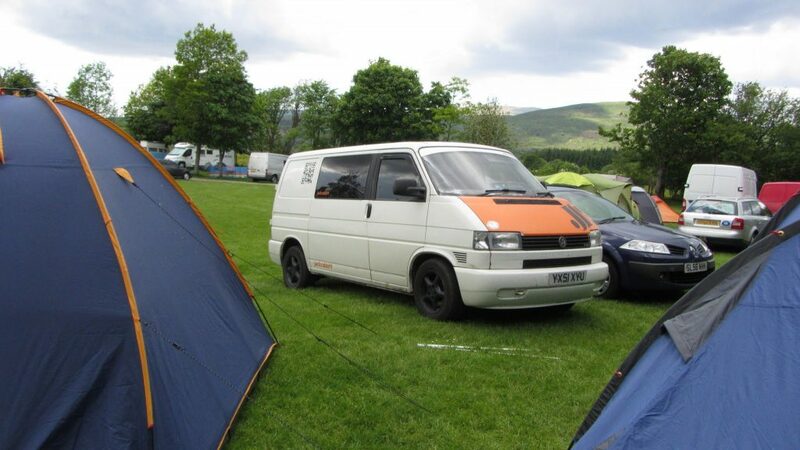 The next steps were to make it our own, so we put extra seats in the back so now it’s a 5 seater, after cracking 2 of the alloys we decided it was time to be a little less cool and buy some smaller more robust wheels that could cope with the gravel tracks etc we seemed to encounter on our adventures. 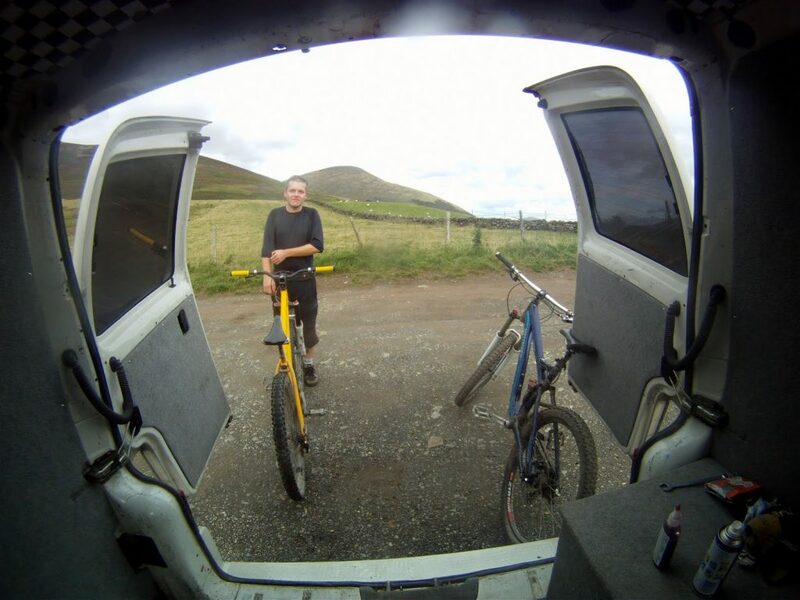 We found that the springs in the back that made it look nice and low, were only good if the van was empty, stick 5 people and 5 bikes in there and we were riding on the bump stops, so we put original van springs back in… and now it rolls like a boat when you turn! 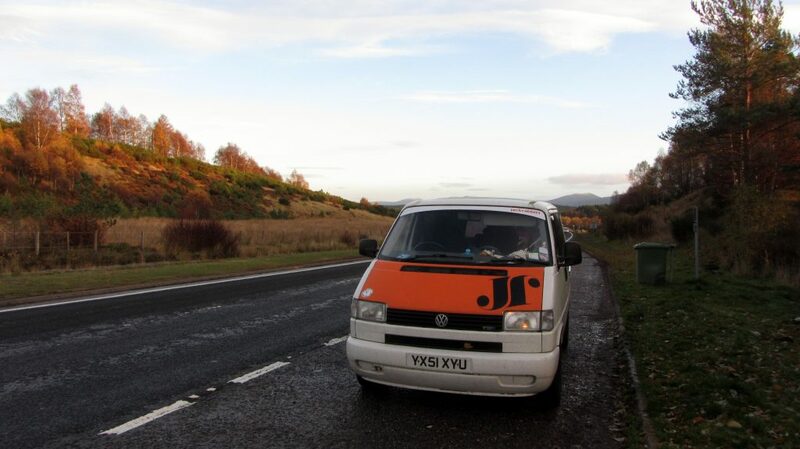 Then, we wrapped the bonnet in orange vinyl and the van finally had the Jackrabbitt stamp, we are now easy to spot from the other side of the motorway! 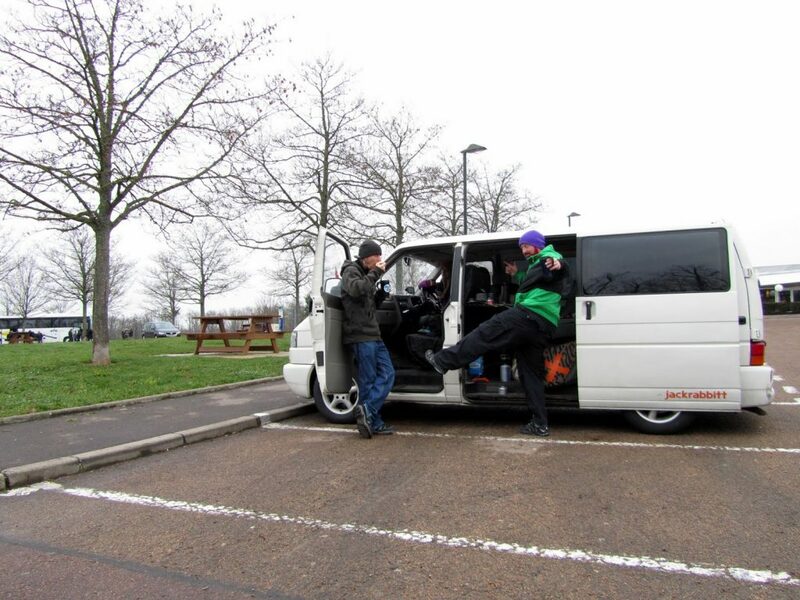 We’ve owned the van for 4 years or so now, and racked up 70k miles in that time, having been over to the Alps in France 3 times, and then all around the UK on a number of occasions. 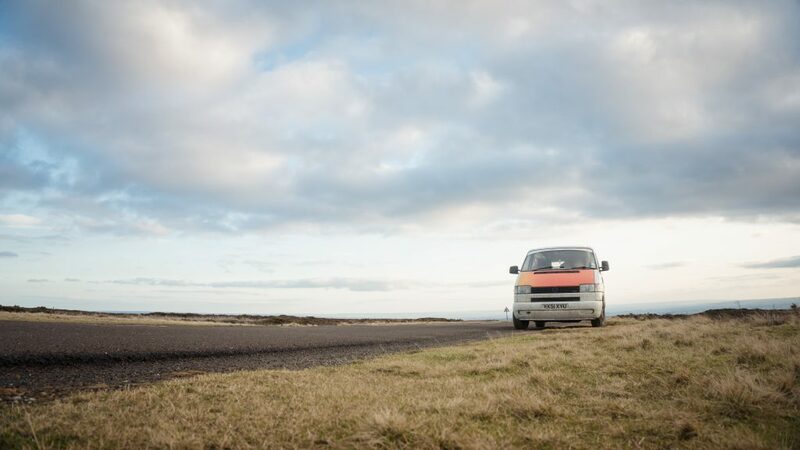 With nearly 250,000 miles on the clock, I hope that I can keep the van running for a lot more yet, and while it’s not cheap to keep an old vehicle repaired and on the road, there is something immensely satisfying to know that this little adventure bus has been everywhere with us. 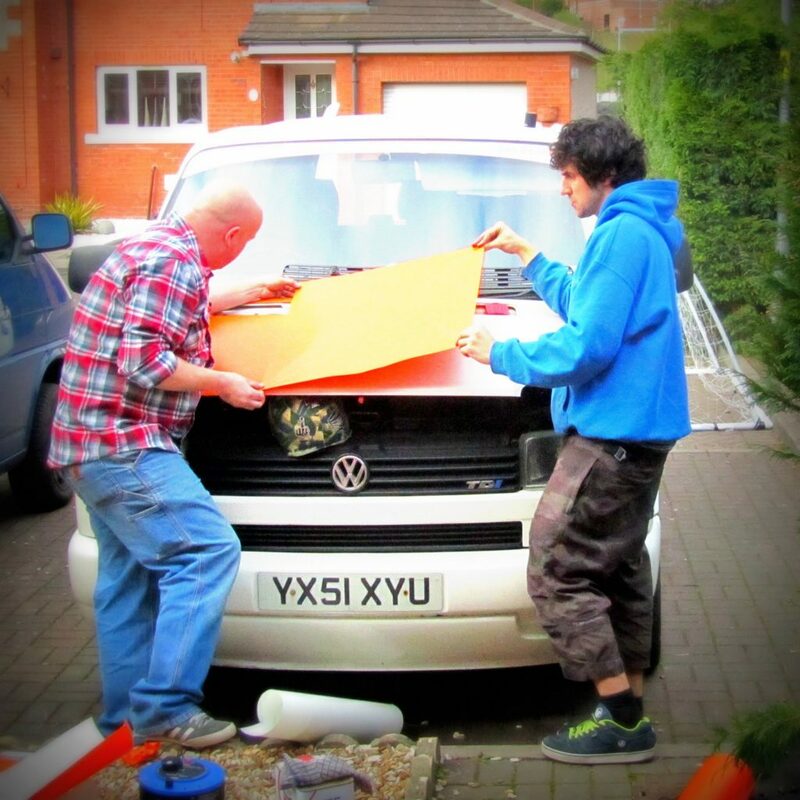 … and I fully intend to put a spoiler on the back doors… for purely aesthetic reasons! This post was basically just an excuse for me to show off some pics of Blue through the times we’ve had him, so here you go! Also, please post post pics of your adventure bus! I’d love to see what you have!